Battleships is a game for two players, and can easily be played with a pencil and paper. The most important piece of equipment you will need however, is your mind! A knowledge of navel tactics is not necessary, but may prove useful. Each player draws a 10 x 10 grid and labels the vertical A-H, and the horizontal 1-10. Each player draws this grid twice, one is to record the position of their own ships, and one to record the squares they have targeted throughout the game. You should have a grid like the one shown below, to save time, you can print it by clicking here. Print it using your browsers print option. It will open in a new window. Each player has a fleet at his or her command, and this fleet is comprised of the following. It is vitally important to the success of the game and indeed one of the fleets, that an object such as a book obscures the enemy fleet position from the opposing player. Once this is done, each player takes turns to fire on the enemy fleet. To do this, they call out a grid reference, say B4. If the opposing player has positioned one of their ships on B4 they say “hit”, and put an ‘X’ or mark the square B4. If they have not put one of their ships on B4, then they say “miss”. The player that fired, should mark the square on their own enemy grid to show a hit or a miss. In our example, B4 would have hit the enemy aircraft carrier. The game continues until all the ships in one of the fleets is sunk. The winner is the player that has at least one ship afloat once the enemy fleet has been sunk. Another version of the game, is when a player can fire on the enemy as many times as he or her has ships in his fleet. So at the start of the game, a player calls 5 grid references. Once he or she loses a ship, they can only call out 4. 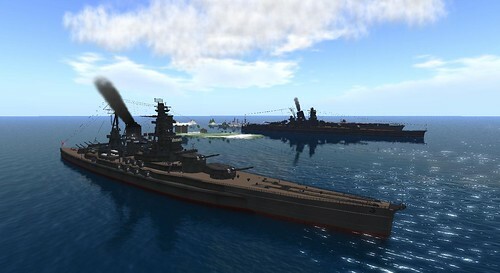 Some versions of Battleships, gives the aircraft carrier the ability to fire twice. As long as the carrier isn’t sunk, it gives the player an additional grid reference to aim at. Sea battles, have become famous and pivotal moments in history. The Battle of Trafalgar (21st October 1805) saw The British Royal Navy defeat the combined forces of The French and Spanish. Admiral Pierre Villeneuve who commanded 33 French and Spanish ships, saw 22 of his ships sunk without a British ship being lost, despite the British Navy only having 23 ships. Admiral Nelson, who commanded the British fleet used new tactics that had never been seen prior to the battle. During the battle, Admiral Nelson was mortally wounded and died. He is believed to be the greatest commander of navel ships ever to have lived. The battle confirmed that Britain could not being invaded by Napoleon, as they controlled the seas. The battle was a turning point in the Napoleonic wars. The Battle of Jutland (31 May – 1 June 1916) was the largest sea battle of World War One. During this time, The British Royal Navy’s Grand Seas Fleet was the largest in the world and was enforcing a blockade of German shipping. This means that ships which brought supplies into Germany, could not do so without being sunk. In an effort to break out of the blockade, The Imperial German Navy’s High Seas Fleet, under command of Vice-Admiral Reinhard Scheer, formulated a plan to try and lure and destroy a large portion of the British Fleet and so end the blockade. The Royal Navy however, had learned of the plan through intercepting signals. Due to both sides making mistakes, more ships were involved in the battle than either side had planned and subsequently the largest naval battle of World War One ensued. Both sides claimed victory at the end. Germany because it had sunk more ships, and Britain because it still had control of the sea. 24 ships were lost during the battle, comprising of 11 German and 13 British. The Battle of Midway (4-7th June 1942). Six months after Japan’s successful attack on Pearl Harbor during The Second World War, The Imperial Japanese Navy planned to destroy America’s aircraft carriers at Midway Attol, by luring the vessels into a trap. America had learned of Japanese attack by breaking her codes, and thus planned a trap of her own. During the battle, The Japanese Navy lost 4 aircraft carriers and one heavy cruiser. America lost one aircraft carrier. The battle was one of the turning point of The Second World War as Japan was never able to replace the ships or crew that she had lost during the battle. Control of the Pacific Ocean was now controlled by America who enforced a blockade of Japan herself. This battle confirmed that the most powerful ship at sea was no longer the battleship, but the aircraft carrier.